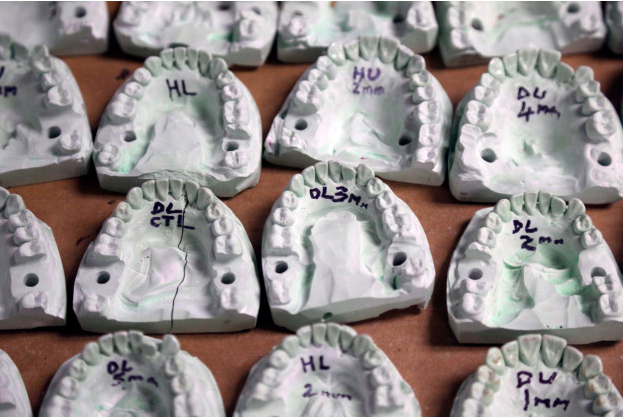 This April 17, 2013 photo shows dental molds used for bite mark research at the University of Buffalo, N.Y. Some argue that bite mark evidence should not admissible at trial because it’s not reliable enough. This month, the National Commission on Forensic Science is pressing the Justice Department to look into ways to improve forensic science standards and how forensic evidence is used by law enforcement and in court. Peter Neufeld, co-founder and co-director of the Innocence Project, explains the problems with certain types of forensic evidence to Here & Now’s Peter O’Dowd. - via Here & Now.